I am so excited to announce the first guest post here at The Primitive Palate! Darcy, from Modern Low Carb, is bringing you a delicious recipe for fresh almond flour pasta paired with a creamy bacon & wild mushroom sauce! The pasta alone has about 7.5 net carbs per serving and with the sauce it rounds out to about 10 net carbs per serving. Not bad, when a regular serving is pasta is a whopping 75 carbs per serving! I wrote to Darcy a few weeks ago about doing a guest post because her recipes look and taste like restaurant quality food. Being a classically trained chef, that get’s major points in my book! So without further adieu, let’s get on to the recipe! Hi, I’m Darcy, and I blog at Modern Low Carb, where I share low carb, keto recipes made with real, fresh ingredients. I’m so excited to be here guest posting on The Primitive Palate. Sarah makes ketogenic food that is both beautiful and delicious, so in celebration of that talent, I wanted to share something special with you today. 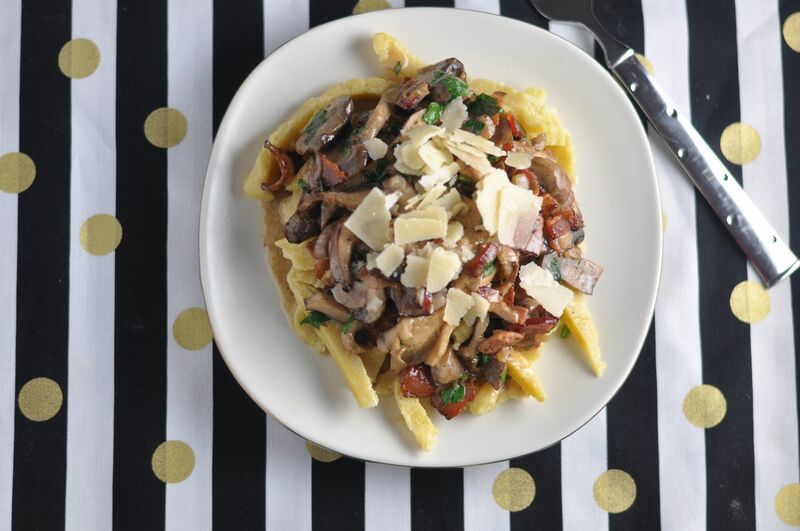 The recipe I’m sharing is homemade almond flour pasta with a bacon and wild mushroom sauce. I love pasta. It’s definitely one of the foods that I miss most from my non-low carb days. I’ve bought almond flour pastas from specialty food stores, and they taste quite good and close in texture to regular pasta. However, they’re ridiculously expensive, so I wanted to try to replicate them at home. For this pasta recipe I use a combination of both almond flour and tapioca flour. A small caveat, the carbs in these flours definitely add up but when you’re eating low carb, a little bit of pasta goes a very long way. 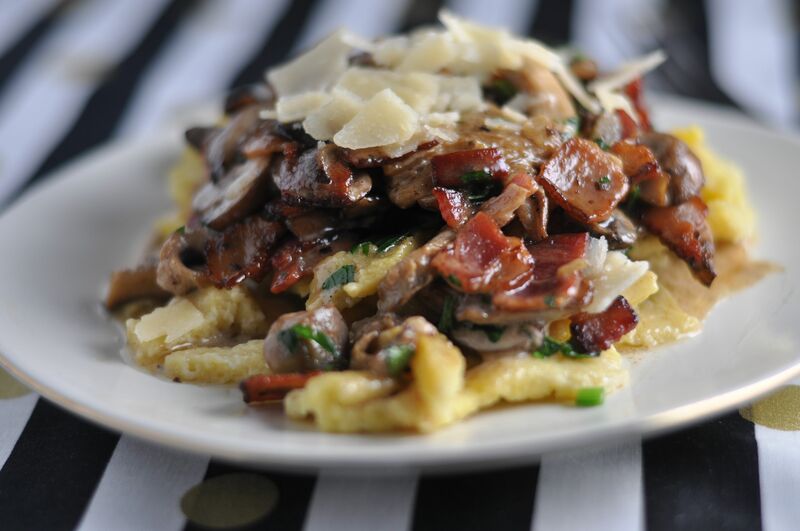 Especially when it’s topped with a sauce of crispy, smoky bacon, buttery mushrooms and cream sauce. This is an incredibly unfussy dish. The fringy strips of pasta pair well with the smoky cream sauce. You can of course substitute zucchini noodles or shirataki noodles to keep your carb counts lower. But if you’re looking for a special treat that allows you to stay on plan, I highly recommend these noodles. Mix almond flour, guar gum, salt and tapioca flour together in a bowl and stir to combine. Make a well in the center of the bowl and add the eggs. Stir all ingredients together until combined. Set aside and allow liquid from eggs to soak into the pasta for about 20 minutes. Because of the flours we are using, additional time is necessary. After 20 minutes, shape the dough into a ball and begin kneading the dough a bit. If it is sticky you may need to dust with a bit of tapioca flour or wet your hands to prevent it from sticking. Using a rolling pin, roll the dough as flat as possible. Slice the dough in ½” strips. Bring a medium pot of water to a boil. 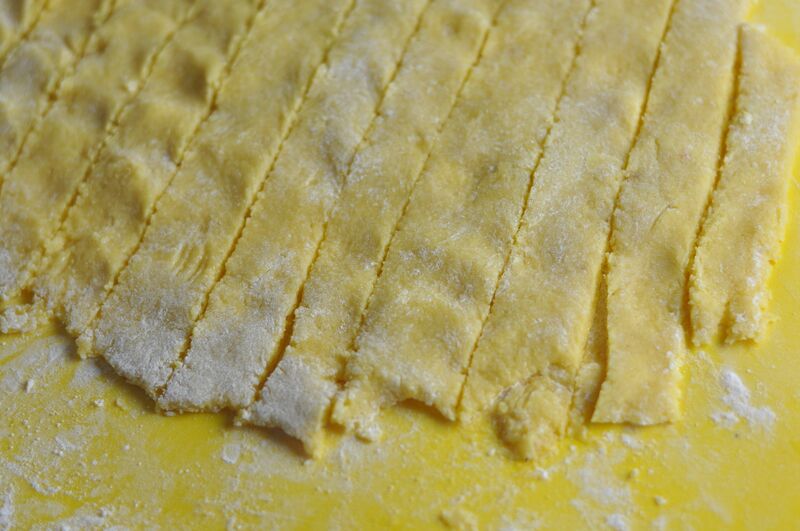 Drop in the fresh pasta strips. Because of their freshness and consistency, they will boil within 1-2 minutes and rise to the top of the pot. Once they float to the top, remove them from the water and drain into a colander. In a skillet over medium heat, add bacon lardons. Cook for 5 minutes or until crispy, stirring occasionally. Using a slotted spoon, remove and set aside on a paper towel to absorb the excess grease. In the skillet with the bacon grease, add butter, shallot and garlic and heat until aromatic, taking care not to burn. Add mushrooms to the pan. Salt the mushrooms a bit (about 1/4 tsp) to bring out their natural flavor. Cook for about 3 minutes, until mushrooms begin to brown. Add bacon back to the skillet. Add parsley, thyme, whipping cream and lemon juice. Cook for an additional 2-3 minutes, allowing the sauce to thicken and flavors to combine. Plate four equal portions of pasta. Top each portion with ½ cup of the bacon mushroom sauce. Finish with a tablespoon of freshly shaved parmesan cheese and salt and pepper to taste. Serve and enjoy! Can you give tthe nutritional info for the pasta please? Hi Cici! I have it listed at the top of the post 🙂 7.5 net carbs per serving for JUST the pasta and about 10 net carbs per serving with the sauce! Is there anything you can use to substitute for the Tapioca Flour? I’m pretty sure I’ve never seen it at any store around where I live. Maybe soy flour? 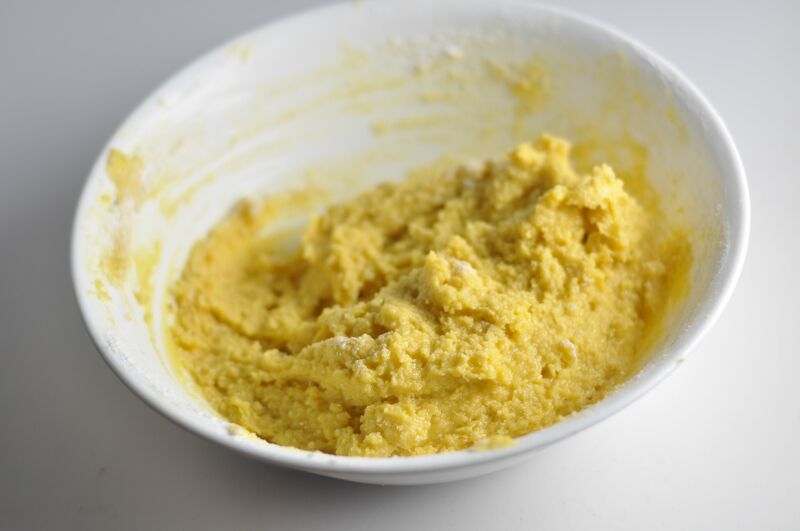 There are not many low carb flour alternatives out there that are so finely ground…and I think more almond flour or another nut flour would be too much fat to hold the dough together. I know Bob’s Red Mill makes it and most health food store or even online store carry it. I’ve bought Bob’s Red Mill products online at WalMart before. It’s easy to get online. I recently made a rolled dumpling recipe similar to this (it seemed more like pasta to me) and it called for almond flour and either tapioca or arrowroot …so maybe arrowroot? Yeah! They seem pretty interchangeable and have about the same carbs! Thanks! Next time I go shopping I will look for arrowroot and tapioca, hopefully I find one of them! Though tapioca flour and guar gum are not my normal pantry items, they may be well worth it if you are closer to maintenance. Yeah! They pretty much do the same thing! Tapioca flour and tapioca starch are the same thing. They are not hard to find at all but if you can’t find it in your store, I would look online. I often do that for things I think my local grocer doesn’t have and then I find out that they do and for a lower price too than ordering on line. Someday I’ll get it right. This looks really tasty. Do you know what the protein fat count would be in a serving. An many servings does this make. Would the dough hold up in a pasta machine? I don’t think so, since there is no gluten in it–it’s not as stretchy as regular pasta dough. Made this recipe a few weeks ago and it was fantastic. Making the noodles again tonight to go with a riff on beef stroganoff. I had some leftover tenderloin steak in the fridge and stroganoff is ideal for using this up. My recipes are always rough estimates. Make the pasta per the recipe above. Reconstitute the mushrooms in water for twenty minutes or so. Remove the mushrooms, wring them out to remove extra water (do not discard the liquid) and chop the mushrooms corsely. Saute the shallot in the butter until soft. add the garlic and cook just until fragrant. Add the mushrooms and bacon and cook for three minutes. Add the cream and allow it come to a simmer then add the beef. We’re just warming the beef through, so it will only take a few minutes in the simmering liquid. Serve over the noodles and enjoy. 43g fat, 11 net carbs, 20 g protein. I’ve made this pasta several times now, but over the weekend I made a double batch and we made lasagna. Holy cow! You couldn’t tell the difference between this and regular lasagna noodles. This is going to be a go to for me forever. Thanks again for sharing this pasta recipe. Hi I’m not allowed tapioca flour. I omitted it but seems like an epic fail. What else can I use?